Aimed at applicants for graduate or managerial jobs, "How to Pass Advanced Verbal Reasoning Tests" addresses the rising demand for more difficult preparation material. Offering unbeatable score-improving practice for online or pen and paper tests, it will help you to prepare thoroughly and impress your potential employer. 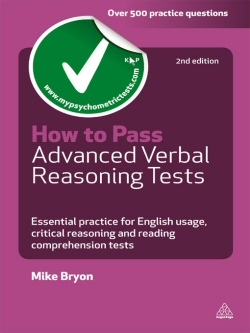 With over 550 practice questions and answers available, covering all the major types of advanced verbal reasoning, along with explanations of scores to help you improve, How to Pass Advanced Verbal Reasoning Tests contains everything you need to know to stand out from the crowd.